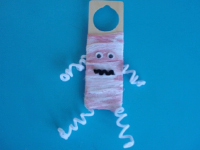 Children will love making this mummy dance around. 1. Gather your material. 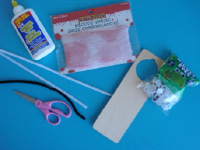 You will need a wooden door sign, two wiggly eyes, two white pipe cleaners, a black pipe cleaner, white glue and/or hot glue, scissors, and gauze. 2. 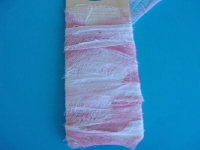 Wrap the gauze around the wooden door sign. 3. Glue two wiggly eyes on top of the gauze. 4. Cut a small piece of the black pipe cleaner and bend it to create a zigzag line that will represent a "scary" mouth. 5. 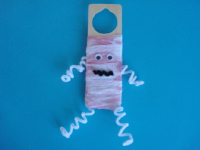 Cut both white pipe cleaners in two and wrap each piece around your finger to create « spring-like » arms and legs for your mummy. Glue an arm and a leg on either side of the mummy. 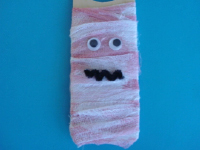 Hang the mummy on a hook or door handle. Let children play with it. 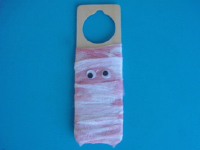 The hole at the top of the door hanger represents the perfect handle for little hands.